In a brave move last week teachers at Saucedo Scholastic Academy, a neighborhood school in Little Village, decided that they would protest administering the Illinois Standard Achievement Tests (ISAT). These teachers took a step in what may be a growing boycott of the test, and in doing so put their jobs and futures on the line. Teachers at Drummond Elementary School, a Montessori magnet school in Bucktown, announced on Friday that they too would boycott the ISATs. Sarah Chambers, who is one of the union leaders, described what happened Tuesday, which is that CPS sent security into the building. But the teachers did not give the test; instead they taught about Rosa Parks, the civil rights movement, and social justice. It was great to witness. Klonsky was previously president of his local of the National Education Association and has been active in social justice movements, most recently the struggles between Chicago's public schools and Mayor Emanuel and the Chicago Public Schools administration. Both schools declined to allow comments by staff on the situation. [The ISAT] certainly has no impact on classroom instruction. When I was a teacher we wouldn't even get the results back for a year. And the ISAT now is not even going to be used in the future. It is simply being done because they have a contract with the testing company, and more importantly it is about who has control over what goes on in the classroom. Do Byrd-Bennett and Emanuel or the [Chicago Teachers Union] and teachers have control over what goes on in the classroom? This questioning has led to action by both parents and teachers. The parent group More Than a Score reported that parents at more then 38 CPS schools so far have opted their children out of taking the ISATs. At Saucedo, over 420 parents have decided they do not want their children to take the test. Yet the CPS administration and CPS CEO Barbara Byrd-Bennett have continued their spirited defense of the exam. Previously, Byrd-Bennett had said that parents could opt their children out of any standardized test administered in CPS. But CPS officials stated on Friday that all students in grades three through eight would be required to take the ISATs and Byrd-Bennett sent letters out to parents asking them not to remove their children from the test. According to a guide sent to CPS schools, obtained by the Sun-Times, test administrators should distribute the exam to all eligible students, and those who refuse to take it must "remain silent while other students test. Students MAY NOT engage in any other activities that would disrupt the testing environment." If an individual teacher refuses to administer the test, you should direct that teacher to swipe out and leave the work place... You should direct another employee to administer the test. Mayor Rahm Emanuel stood by her threats, saying teachers should not have a role in pulling children out of the test. According to Emanuel, as reported by CBS 2, "She made the right call." Even so, teachers at Saucedo have stood up to threats and stuck by their principles. The CTU has said that it supports the teachers' protest, and will defend them from any disciplinary actions by the CPS administration. The union stated that their members feel that students are tested too much and the teachers protesting are simply trying to do their jobs and educate students rather than teaching to the test. Although the fight against the ISATs is a new development, battles in which the CPS administration and the mayor are pitted against teachers, parents and the CTU seem to be becoming familiar. Just last year, CPS shuttered 53 Chicago public schools with the mayor's support, which resulted in community outcry and loss of jobs by 850-school employees. In addition to the closures, Emanuel has also pushed for the unprecedented expansion of charter schools in Chicago. And in 2012, Chicago teachers went on strike for nine days, successfully defeating Emanuel's push to tie teacher salary to student test scores and decrease job security. 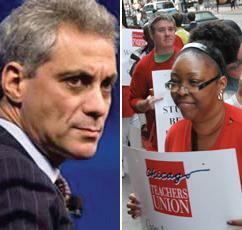 Some even thought that Emanuel's school closure was retribution for the teachers' strike. This whole battle by Byrd-Bennett and Emanuel over the ISATs has a lot to do with their continuing battle with the Chicago Teachers Union over what is best for classrooms and communities. Who do parents trust as to what is best for kids in classrooms? Their child's teacher or Rahm Emanuel?... The CTU has always framed their orientation as one of social justice. They call themselves a social justice union. Klonsky, and others involved in the struggle, see the fight against the ISATs, and the general education battle in Chicago, through the lens of social justice. It is no coincidence that teachers at Saucedo chose to teach about civil disobedience on the day when they refused to administer a state-mandated exam. The saga drags on as Emanuel and Byrd-Bennett defend the ISATs and threaten teachers, in what seems to be a reflexive stance for them against parents and educators. But attempting to force teachers to administer, and students to sit for, a completely unnecessary exam raises the question of whether they are putting students first, or their own quest for the upper hand. It remains to be seen what concrete actions the city and CPS will take against teachers who have not administered the exams. In the war between the city administration and the schools, the score may be a tie. Emanuel successfully led the largest single school closure in US history. And the CTU was arguably victorious in their 2012 strike. Now, it remains to be seen which side will be the victor in the battle over the ISATs or if a clear victor will even emerge. Yet it is also important to remember that in battle there are always casualties, and this case is no different--as Emanuel, Byrd-Bennett and their staff continue their battle against CPS schools and the CTU, Chicago's students suffer. Thank you for this wonderfully written piece about the ISAT boycott. Quoting from Fred Klonsky gives this article an exceptional source I order to get a picture if what is going on during this struggle. There is one exception I have about this article and that is the way it ended. Implying that children are suffering because of the action of all adults involved. In reality the very point of this boycott is to stop the abuse of children in the classroom. To stop the tremendous amount of pressure put on children to get high scorches on a meaningless test. A test that most educators would say has no validity. However, these high stakes tests are what were used to close schools. I sat through a hearing that the reason one school was closed and the other remand open was because of a .001% difference. A major theme if the boycott is to stop feeding the data machine, that turns our children into numbers. The foundation of these test are from the eugenics movement and to this day are racially and culturally basis. The children that have been opted out by their parents are actually happy about not having to sit for hours during last week and this week filling in bubbles. Unfortunately there are children that are suffering and are being put into horrible and abusive situations. Many of these are blatantly against CPS code and are in violation of the law. Any one of the hundreds of stories that More Than A Score was been and continues to collects are due to actions of Principals, Vice Principals and other members of CPS administration. BBB and Rham are responsible for the welfare if our children when at school and therefore are ultimately responsible for any actions that place children in positions that are causing physiological and/or emotional pain.